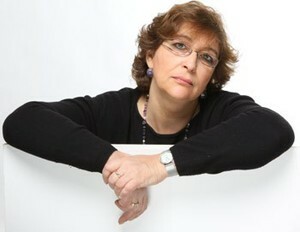 Yevgenia Albats was the first Soviet journalist to investigate the Soviet political police, the KGB in the Soviet-era. She is the author of The State Within A State: KGB and Its Hold on Russia. In 1989, she received the Golden Pen Award, the highest journalism honour in the then-Soviet Union. She was an Alfred Friendly fellow in 1990 and a Nieman Fellow at Harvard University in 1993 and worked freelance for the Chicago Tribune, Newsweek, and the CNN bureau in Moscow. She has a PhD in political science from Harvard University and teaches at the Moscow-based Higher School of Economics University. Albats is the author of four books and currently is Editor in Chief and CEO of the Moscow-based political weekly The New Times, one of the few independent media outlets in the current Russia. She is also a talk show host for two Russian networks. Read more about Yevgenia Albats here.